Japanese Slice-of-life. I give it 3* because the setting would be interesting in a "real" novel. Damn it I hate flashbacks. And it's not even about the main cast, just some people who weren't even properly introduced (might be that author want to introduce them through the flashbacks... but I hate flashbacks). The story does not even focus on Red OR Lit anymore. The romance, their life (for those crying this is a slice of life) takes a back seat. One of the most surprisingly deep light novels out there, the world is carefully constructed in such a way that the pecularities of the world are crucial to the plot. The entire world is a parody of RPG tropes, but at the time taken seriously by the author. In short, it's reconstructionist or even hard fantasy. For example, the MC has the Guide class, which translates to the RPG tropes of a Jeigan character, a strong, but temporary party member you get in the beginning who shouldn't be invested in because... more>> they have low long-term potential. So he gets booted out of the party before the story begins by the party's Sage, who essentially corresponds to an in-world min-maxer. In a great send up, the MC is stripped of all his heroic gear except a worthless copper sword and sent out of the party, just as we are generally advised to do for temporary characters who might otherwise disappear with epic gear that could better go to the new replacement party members. What makes this novel great is that the above is all taken very seriously. The author never makes it obvious that is it a parody, the reasoning is explained in-universe convincingly that the hero's party is defeating the Demon King and obviously it's a better use to save the world than for the MC to keep the gear he personally helped quest for. Thus begins his Slow Life, the genre of "I am in a typical fantasy (RPG) world, but rather than pursuing the hero's quest, I am going to have a slice-of-life story of me not doing anything particularly of note." Where this novel sets itself apart from its peers is how well it plays by the rules of the RPG world yet has a realistic response from the characters of people stuck in a fantasy RPG world. The novel heavily plays on the existential horror of being consigned to a Class and more lightly upon the equal casual horrors of a world where you grow more powerful by killing things and gaining experience. Also, despite it's Slow Life at the Frontier setting, the novel doesn't ignore the Hero's Quest at all, carefully parsing out dribbles of what's going on, and teasing the audience with the idea that the MC will get embroiled in the Hero's Quest again as even his sleepy town is affected by the rumblings of the conflict between the "light races" and the demons. Not that we expect it to happen because that would imply a genre shift, but it's surprisingly effective teasing nonetheless. What drives the plot is the conceit that classes impel a person to fulfill being the ideal representation of their class, and the stronger the class, the stronger the compulsion becomes. This idea is examined in-depth and is the motif running through virtually every story arc. All of it is also set against the greater backdrop of a possible "Rebel against the Gods" RPG storyline too, and it wouldn't surprise me at all if it incorporated "The Demon Race isn't really evil, but Evil in that they are fighting against Good, which isn't really good" which could easily end up with the MC allying with the Demon King in the end in the fight against God, all which of, again, are standard deconstructionist RPG tropes. Also features one of the sappiest romance subplots I've come across in recent years, if that's your jam. Eye-rollingly non-s*xual, but endearing in its own right, and at least their slowness is, again, explained plausibly in-universe. Also, probably plot-centric because the Hero happens to be a yandere bro-con, and the MC is the onii-san in question. And for the record, the reason she's a yandere is also explained in-universe making her a pitiable Hero. I hope this one can get a lot of attention. The story is promising, cuz there is a solid logline. There is still a job for him to do, but he was chased away. Its a slow life, where you can get enough of cuteness (hopefully) and a life. No OP (for now) and hope it will. And I think the MC is not a dump man. And this review is not certified yet. The story itself is a refreshing take on a fantasy slice-of-lifesque story without the worn isekai + cheat combo. At the beginning I thought the MC was a bit of an idiot but he got better, thankfully he's not a blockhead like so many other characters..
Edit: Eternal praise for a good romance and no harem, seriously. First let get the premise out of the way. 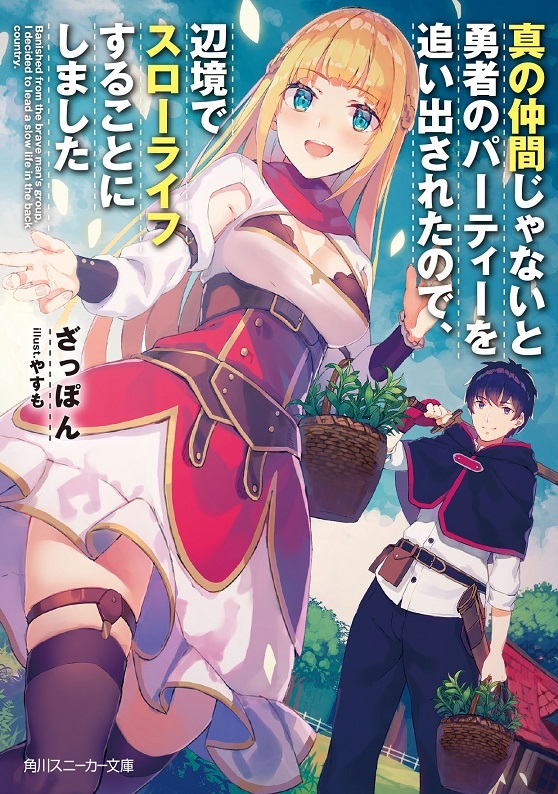 This is a cookie cutter novel straight out of most the recent Isekai/Fantasy novel with game like element. In short, God give blessing/job and you are stuck with it till you die. Not sure if you can advance like from apprentice blacksmith to intermediate or so but you get the jest. These type of novel live on few key things: the execution, characters, interaction and the MC ability to carry the scene. So far so good is what I gonna say. The... more>> first 10 or so chapter is quite slow but from the name, this is a slow novel. MC sometime belong to the type of missing common sense but in ways that I can believe for a person been raise in royalty/savior of the world type. The equivalent would different value between civilian and government. A normal civi might spend years of his saving for a $100k car while the government can say that a $30 million jets cheap. If you were in a medieval age where the king IS the government, your sense of value would be quite skewed and the MC sometime display something like that. Romance, the flag that kill many novels. I hate force harem and romance where it doesn't belong/under cook. Realist Hero is a great example of it. So far, the MC has committed to a target and if you read the description, you would found out who. Reading their interaction was fluffy and heart warming because I don't really have high demanding for romance writing. Just make it feel normal, believable and loveable. Real life relationship isn't that flashy anyway. What else there is, MC is competent, interaction is believable, relationship is nice and character is nothing bad so far. Rating might change if author f**k thing up but as of now, go read it. Just remembered this is a slice of life novel so don't expect any fast development or so. Edit: NO HAREM. The author said it himself. Huzzah. The story is still solid, character interaction is better than ever, world building got deepen and overall a solid and enjoyable experience to read. Of all the new novel I pick up recently, this is no doubt one I enjoy the most. I have no beef with harem when done right but with japanese author writing style where all girl are equal and get treated normally by the MC and sometime even declare themselves to be in the harem, it never fly well with me since most of the time, their personalities consisted of at most 2 generic trait that can be found anywhere. True harem need some sort of hierarchy else it would just going down a cluster f*ck, arguing and other nasty thing. c54 Edit: Kudos to author, this chapter is great. I suggest you to read yourself to this chapter and not read the spoiler but for those who developed motivation to read after reading a spoiler go ahead. What has happen in this chapter is a respectable thing from the author. Truly one of the best romance/fluffy novel I had the honor of reading in recent year. MC meet up with his sister at the end of chap 54 surprise me. In these type of "looking for an important person" type novel author like to tease the meeting with "near miss" to the point of frustration but here, like the romance, short, straight to the point and lovely. I am current the translator for this novel in another language, actually I translate it from eng -> my own language so I have to say thanks to Tseirp for picking this marvelous novel. Although I dont get anything while doing that but I really love this novel so it was my motivation. And even if someone donate me I would use that money to donate to Tseirp. Too bad my japanese is just barely N5 so I cant do much except waiting for new chapter in eng. And about this... more>> novel. I think this novel has a very balance between action and romance, the plot is like a flow up and down, although this is Slice of Life but it's not boring because everything is not repeated but the author always adds new thing for every chapter, it'll make you feel like a child that excites to open a present box every day. I'm glad I stuck with this story, because it really beat my expectations. The premise is similar to other "I was kicked out of the hero's party so now I'm living my own life" stories, but what sets this story apart from them is how the characters are portrayed and how the plot moves. The MC is actually likable, and he's not the typical beta male we see in other JP novels. He's not a submissive character, but he does have low-self esteem, which had been caused by years (?) of... more>> dismissive remarks and abuse from his teammates. Yet despite this, the MC is actually calm and at peace, knowing that all he wants is to live a quiet life doing stuff that makes him happy. He doesn't feel a need to go and "prove" himself, which is what a lot of other sh*tty beta males end up doing. Interestingly enough, his personality actually causes him to be somewhat of an unreliable narrator when it comes to describing himself. He often states how he isn't a master at certain skills and how he's limited in what he's capable of. Yes, he isn't a master, but he's a jack-of-all-trades kind of guy, and he has the intellect to utilize what he knows. This makes him a formidable ally, but one who is often overlooked due to not having a specific talent. But that's literally what his Divine Protection is. He's a "Guide." To expect him to be something other than a support teammate is incredibly stupid. His teammates took him for granted, and they're definitely regretting that. The heroine is pretty adorable, and I like seeing her interactions with the MC. And thank god, this story is not a harem. The romance isn't slow either. It's a quiet sort of love. They get together pretty early, and you know that they're happy together. The side characters also have personality, so it's not like the story is limited to the MC and heroine. As of now (ch. 39) things are getting kind of dark, so this story isn't going to be 100% fluff. There's an actual plot, with important questions raised about the current world's status quo. This is a surprisingly well-written story with a well-developed cast of characters that have a lot more depth than how things might appear at first appearance. Also, rather than a generic setting, it looks like a lot of very interesting things are happening behind the scenes. I like the main protagonist a lot and also enjoy the other characters. "Side-characters" don't really feel like side-characters and also have proper development. The story starts out slowly, but appears to be setting up bigger things very nicely. I liked the start but it gets boring. I mean I know that the title kind of suggests that, but I'd like to know more about the general affairs of the world, about the hero, about the demons... not some random children's problems and some useless villagers. Sigh, it's a Japanese novel after all. Don't know why I expected anything from it. Even more than so given its title.
. Rinse and repeat, and the pattern will get boring for some. With all of these Blessings of the XYZ about, you get a Justice League vibe. If you look closely, the MC is very much like Batman. Despite the sh*tty cards he was dealt, he min-maxed his build to its peak. To compensate for his "lacking" he fights entirely based on observation, preparedness, and technique. In this regard, his little sister is the Superman of this world: forever isolated because she is all-too powerful. I wouldn't doubt there are people who'd think the MC is a Gary Stu because of all these traits, but that is the main appeal of this entire novel: Underdog on the streets, Overachiever in the sheets. The author does a good job of paying attention to the rest of the cast. However, you never hear anything beyond Zoltan (as of c75). The setting itself is quite decent, but everything else is so dull (half-assed at best). It's supposed to be fantasy world, but I can't feel the 'fantasy' feeling at all. Simply boring. I'm wondering why this novel's rated so low? At the moment the pace is rather slow but that's what I expected from a slice of life novel in the first place. At the moment, I find the premise of the story interesting and still hoping to learn more about the slow adventures of the MC. It's alright. It's one of those fantasy worlds where everyone has a job/class/role/gift from birth, but there are problems with that system here. Namely, the gifts are completely arbitrary, so a poor peasant might get "General" or "Royal Poet" or something like that, and a noble might get "Bartender" or something. You can also only level up your gift by killing stuff, so even non-combat classes have to go out and fight. And lastly, and most central to the story, your given gift will actually affect your personality. Someone with the... more>> Bar Brawler gift will get violent quickly, someone with the Torturer gift will get urges to hurt others, and a Hero will have uncontrollable urges to save people. It's an interesting premise, and they tie things together pretty interestingly. The MC is alright (if a bit on the negative side), whose thing is that he's high level but can only use common skills all classes can get. A story that deserved 5 star. The current chapter is too early to have main development but we can see now how our MC works hard. How the heroine appreciate him and how he live in peace and spend his life to be an apothecary, with his abundant knowledge in many field. His divine protection is also "Guider", from the word itself we can expect some good development here. It masquerades as a fluff novel centered around an OP MC who is trying to live a quiet life around normal people. Indeed, it even starts out that way, but the novel is good because offers a lot more. It's got a great romance with adults who have never fell in love before. The MC is laid-back because of lack of confidence in his skills, but he's not beta. It's even got a proper plot besides the MC wanting to live a quiet life, and asks some tough philosophical about... more>> what makes a person a hero. The side characters are relatively fleshed out, but more importantly the author is able to introduce plot points/characters that will be useful for the plot development later. The author does a good job balancing what happening between with the MC and what's happening in the overarching world. A cute slice of life romance novel. There's some action sprinkled in along with an overarching plot in the background, but so far it's been about this couple. My only complaint is that the romance didn't have a build up, but I'm at least grateful it didn't last 685 chapters before they hell hands. I personally liked the story. I'm always in for some slow life. But I have to say the whole divine protection system is sh*t. It's like god playing a strategy game. This is Slice of Life done right.